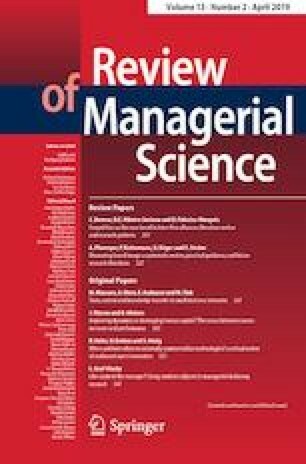 This study suggests that an impending turnover may create incentives that motivate employees to undertake actions to window-dress their performance. “Window-dressing performance” refers to an increase in an individual’s performance in visible dimensions (i.e., high level of quantitative performance) which is not necessarily accompanied by an increase in dimensions reflecting quality (i.e., low level of qualitative performance). Through such behavior, employees aim to manifest a good appearance to a potential destination firm. By doing so, employees manipulate performance signals for their self-interest to boost visibility in the labor market and garner additional bargaining power throughout the turnover process. This study focuses on the Korean security analyst market and employs fixed-effects difference-in-differences regression to empirically test the hypotheses using a sample comprising 5247 observations from 2000 to 2013. We find that analysts window-dress their performance in times of impending turnover by increasing quantitative performance (i.e., forecast volume), which is not accompanied by an increase in qualitative performance (i.e., forecast accuracy). This study contributes to previous research by improving our understanding of the pattern of performance changes immediately before an employee leaves the organization to join a competitor firm.